If you’re in pain or have a dental emergency, call us now. Office: 978-744-7575 Even if you’re not our patient, we’ll get you in today. For patients of record, we have an “on-call service” for emergencies, 24 hours a day, 7 days a week. Dr. Burba will be contacted immediately. Our focus, when you come in, will be getting you out of pain. After that we will discuss a more permanent solution. There are many types of dental emergencies, including a cracked tooth, a tooth knocked out, a crown or bridge that has fallen out, and toothaches. No matter what your dental emergency, we’ll be able to help. One of the most common emergencies we see is for toothaches. A toothache is often because of an infection resulting from tooth decay. 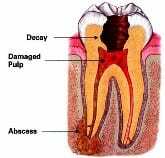 As the decay progresses and reaches the pulp of the tooth, the pulp becomes infected. Your body’s natural defense system kicks in, and it will try to get white blood cells to the pulp to help fight the infection. Because the pulp is in a confined space, as it tries to swell to accommodate the white blood cells, there will be significant pain. If the infection is left untreated, the pulp will die. When this happens, the pain stops, but the problem is not eliminated. The infection continues, even into the bone, causing an abscess. If an abscess is left untreated it will not go away on its own and could end up causing more health complications. One of the reasons people neglect their dental care and treatment is because of fear. They may have had a traumatic experience with a former dentist and have been afraid to go back since. Dr. Burba is gentle with his patients and sensitive to their fears. He will take you through every step of the process. His numbing procedures are so gentle that even children cannot tell when he gives them a shot. If you’re in pain, don’t wait any longer. Call our office immediately (888-285-1543).